Adam Standiford is pictured with his six-year-old daughter, Savannah. Shopping at Target: A seemingly simple task that thousands of people do every day. But for one family, their weekly trip to the Target store in Dardenne Prairie, Missouri, was filled with stress. Until this week. Adam Standiford's daughter, Savannah, has a rare chromosomal deletion that causes life-threatening conditions such as hydrocephalus, uncontrolled epilepsy, cerebral palsy, a heart defect, chronic kidney disease, a complicated and small airway and severe intellectual impairments. The 6-year-old has had four brain surgeries, is g-tube fed and doesn't walk. "When Savannah was younger we were easily able to whisk her up -- oxygen tank, apnea monitors and all -- and put her in cart or use her stroller for transportation. As she has aged, she has grown as well as our family. She is currently almost 4 foot tall and nearing 35 pounds. She no longer fits in a standard shopping cart," Standiford told ABC News. 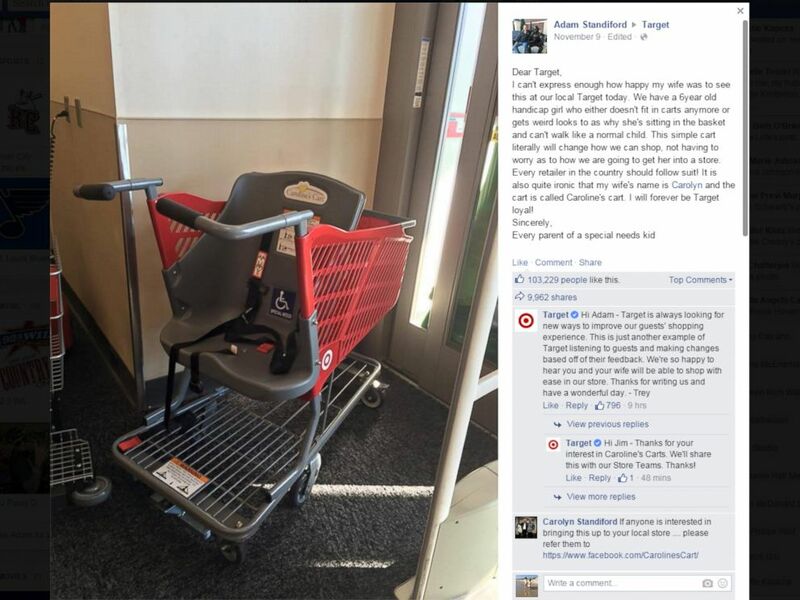 So, when his wife came across a shopping cart designed for older children and adults with special needs on a Nov. 9 trip to Target, she was elated. In a post that's since been shared nearly 10,000 times on Facebook, Standiford wrote that the cart will "change the way we shop." This screen shot shows a posting by Adam Standiford to Facebook, Nov. 9, 2015. The cart is called "Caroline's Cart," and was created by Drew Long, a mom from Alabaster, Alabama, whose daughter, Caroline, has Rett syndrome. Long told ABC News the cart was created when she got "tired of struggling with my special needs daughter at the grocery store." Long said her goal is to create an inclusive shopping experience for all. "Retailers provide electric scooters and fun carts for customers, but never before has there been a shopping cart for those with special needs," Long said. Since she created the cart eight years ago, many chains have come onboard, including Kroger, Target, Whole Foods, Trader Joes, Hannaford, Wegmans, ShopRite, Publix, Tops, and Price Chopper. The cart must be purchased by the store by request. Without a Caroline's Cart, Standiford said, going to the store with Savannah but without another adult is "nearly impossible. You need one to push the wheelchair, one to push the cart, and one to handle the other children you have with you, meanwhile do your shopping you came to do." Target did not immediately respond to ABC News' request for comment, but a Target employee did respond to Standiford's Facebook post, writing, "Target is always looking for new ways to improve our guests’ shopping experience. This is just another example of Target listening to guests and making changes based off of their feedback. We're so happy to hear you and your wife will be able to shop with ease in our store. Thanks for writing us and have a wonderful day." "One tiny aspect of our life is now less stressful," Standiford said. "You can guarantee that I would choose the stores such as Target offering Caroline's Carts over other stores simply because it not only makes my shopping experience better, but impacts my daughters experience significantly. If anything can positively affect a special needs child's life and make it just even a little better, it's a beautiful thing."